I just have to ask this burning question. Is every man gadget crazy? Is that just bred into their DNA? I know it is with my hubby, and he’s here today to share his latest fun toy. From Tim: This is Product Test Saturday! 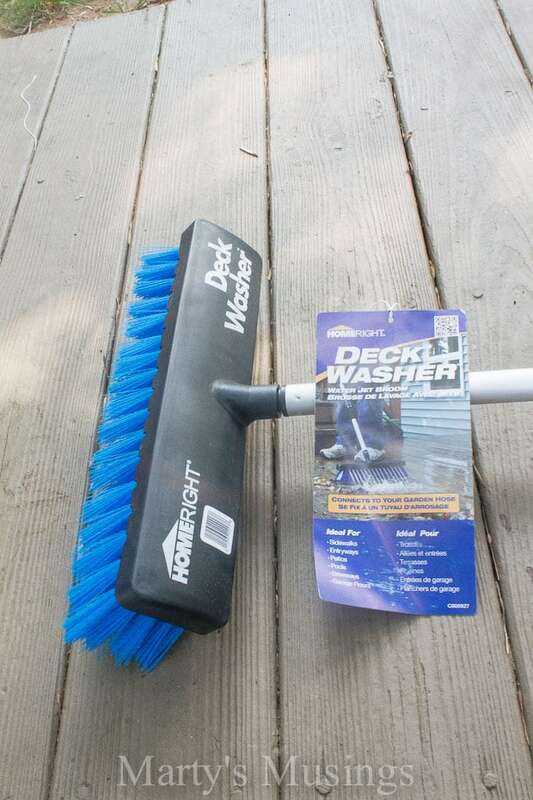 Today, it’s the deck and patio washing using the Deck Washer Flow-Through Broom by Homeright. 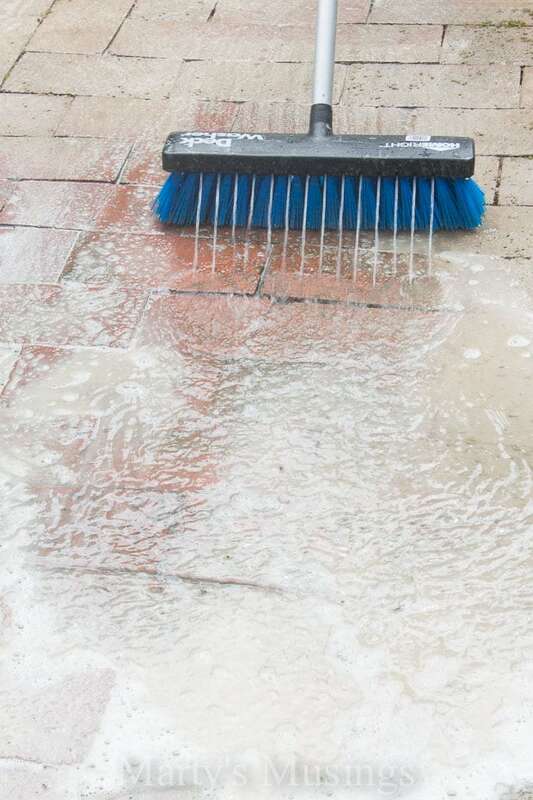 This is a clever, heavy-duty deck broom with an added feature – the water jets. 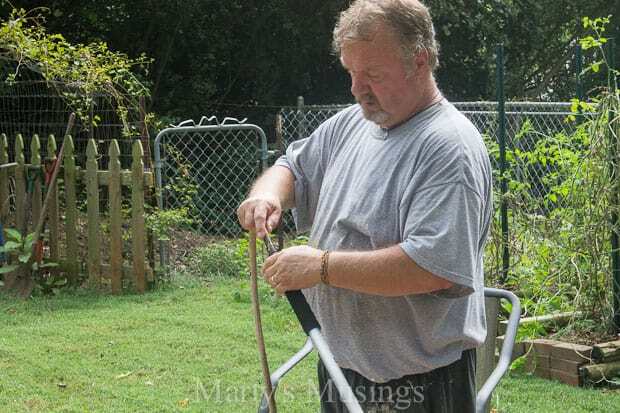 The broom hooks up to a standard garden hose and has an optional chemical reservoir included with the product. This is a well-built product and is quite long, enabling the user to stay away from the funk as you clean! Looks ordinary, but you can see in the product picture where the water jets are, right above those blue bristles. Now, I was attempting to clean some very large areas, so I opted to use a 2-gallon pump sprayer to apply the cleaning solution. 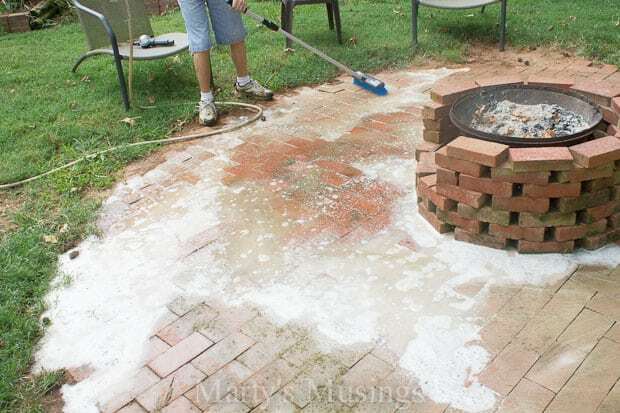 I keep a 5-gallon bucket of mystery solution to use when I pressure wash decks and houses; it is a running mixture of Jomax concentrated house cleaner, exterior Clorox bleach, Krud Kutter, and TSP, all topped off with water. It’s a great solution, but simple exterior bleach works just fine. Fill the sprayer, pump and go! 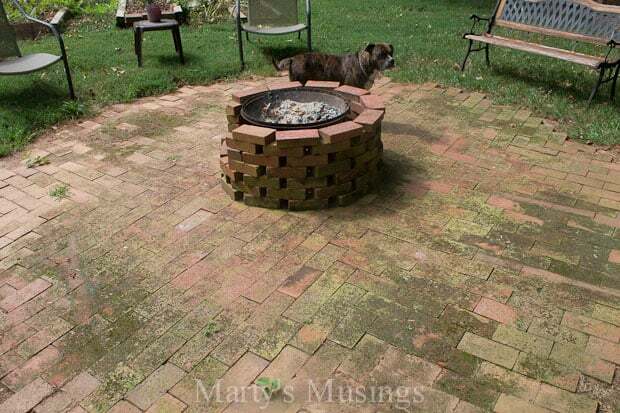 I decided to start with the fire pit in the back yard. 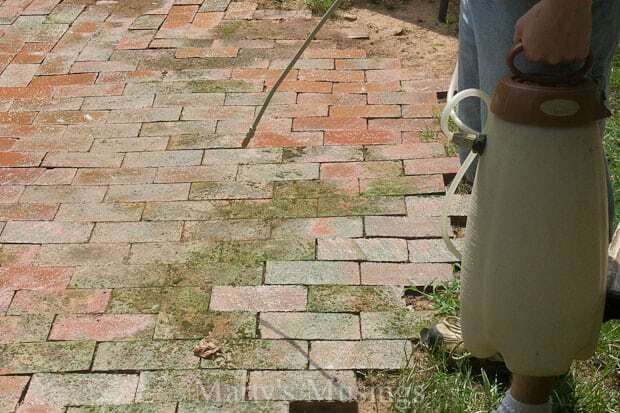 It is just brick with white sand brushed in the cracks, but it cannot be pressure washed since it would just blow everything apart. Clearly it needed to be cleaned! 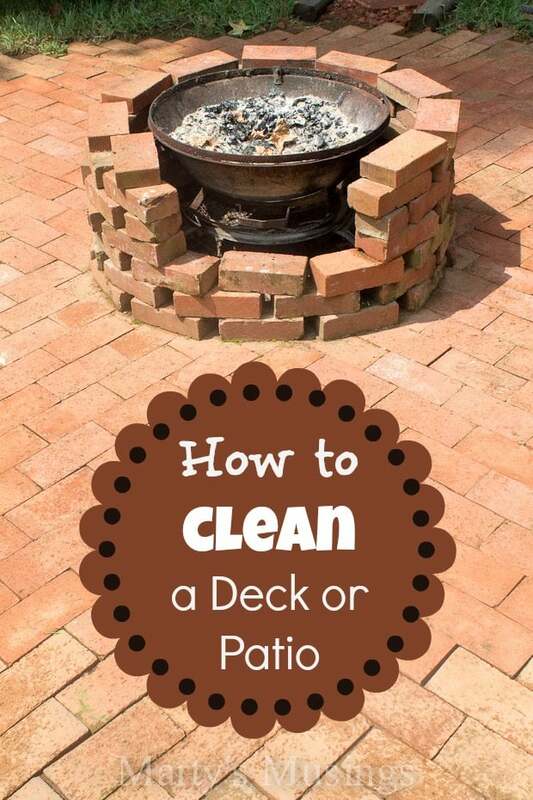 This is just a moss and dirt build-up and a great challenge for the Deck Washer. not to mention being just plain ugly! Our boxer/pit mix Holly assumes her supervisory position and we’re off! Not rocket science here, folks. Just spray the solution on and let it do the work. The general rule of cleaning exterior surfaces is the more chemical used the less pressure has to be exerted. So we’re going to let this solution sit a good while before we begin cleaning. Remember, we not only want to clean the surface, we want to kill and retard the growth and return of the mold as much as possible. Time for the Deck Washer. 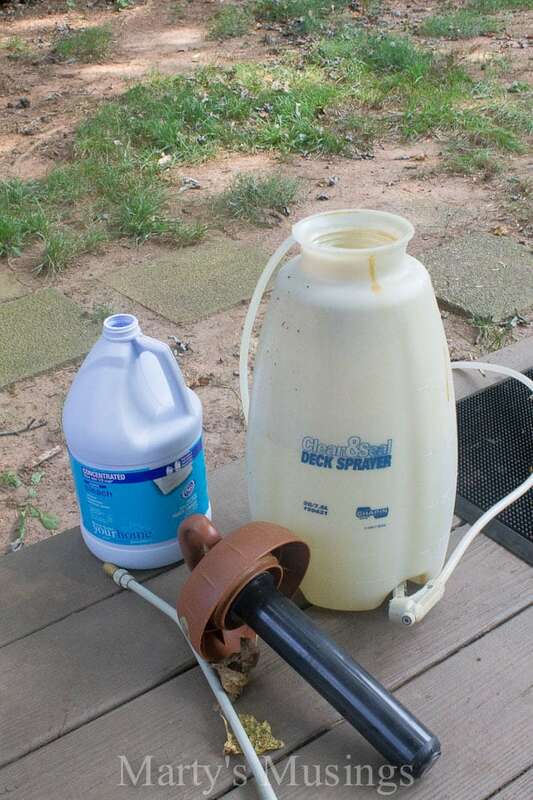 The garden hose threads onto the receiving end of the product and, if the chemical reservoir is used, there is a cut-off valve in the line to control the water flow. I removed the reservoir, so when the water gets turned on, it’s time to roll! And we’re cleaning! The amount of water pressure you have is really not important. Again, we’re not pressure washing here and the real work is done by the bristles. The water serves to move stuff out of the way and let you see how well things are progressing. My son insisted on some time on the business end of the Deck Washer, so he continued to scrub away. The chemical reservoir is on the chair behind him and he actually has the water turned off right now. Not a bad idea, if you just need some serious scrub time. This is no reflection on the Deck Washer, but we had to resort to hands-and-knees with a wire-bristled brush. This was simply because the moss had built up to the point that it required this added abrasion. 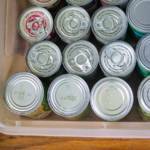 With a surface that is in better initial condition, this process would not be necessary. Needlesstosay, this surface will not return to its current condition at any point in the future…note to self! While my son was doing his best Cinderella impersonation at the fire pit, I moved up to one of the decks with the Deck Washer. I had already applied the chemical so this was cleaning time and the Deck Washer really showed its stuff! We have two dogs, one of which believes that my decks are her toilet, so it gets pretty funky. The Deck Washer did a great job in removing everything I expected it would. 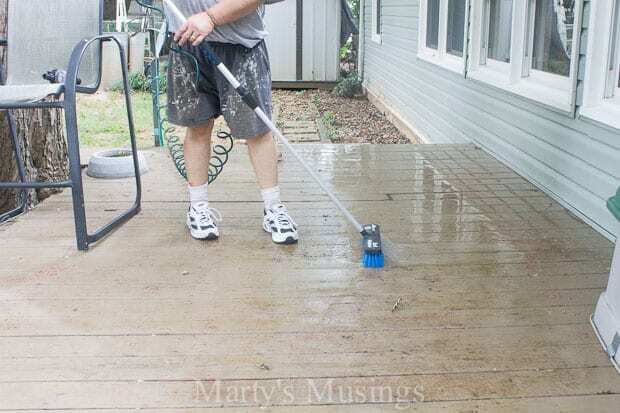 Remember, not pressure washing, so there is no removal of previous deck stain product going on. To be honest, I will likely do that down the road when I prepare to re-apply a new product. Today I just want to get all the dirt and dog traffic cleared away. So, I couldn’t resist going crazy with my new toy! Using the Deck Washer on the vinyl siding was awesome! 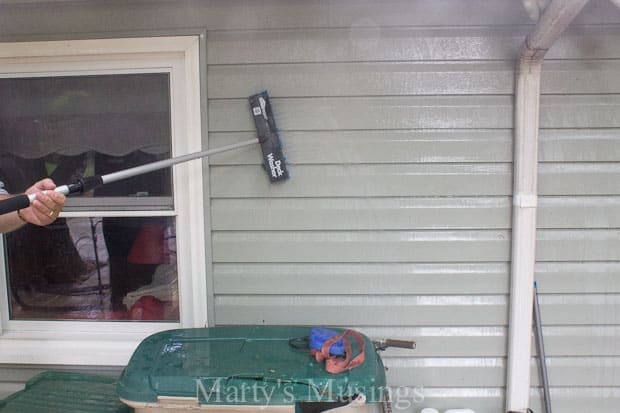 You get the benefit off the bristles while the water jets wash everything down the side of the house. Here again, too much pressure with the pressure washer and the vinyl blows off the house, but with this handy tool, cleaning is a breeze. 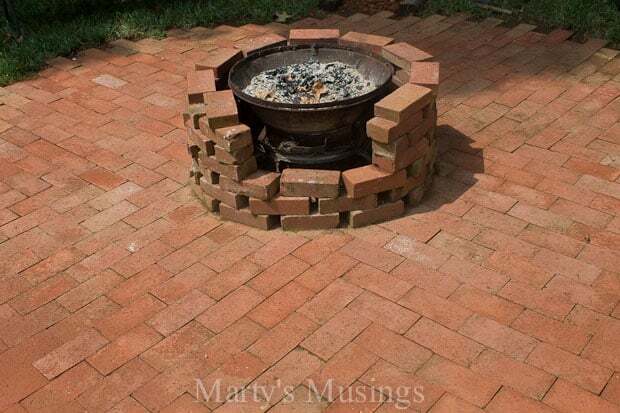 Here is the end result of our efforts back at the fire pit! The residue of the chemical will continue to kill the moss, but this is much better than when we started. 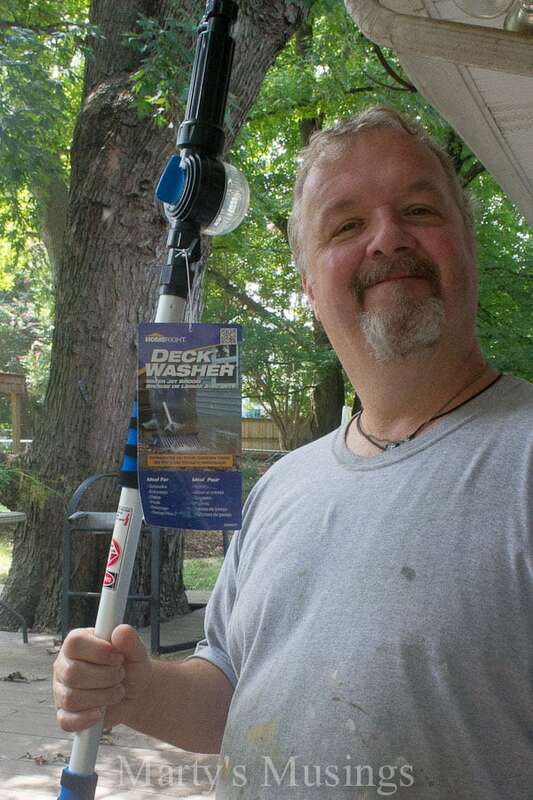 The Deck Washer is a great tool for basic home use, and at just under $30, it is a nice piece to include in my arsenal. This is not a contractor-grade device, but for the DIY-er with a small surface to clean and no desire to own/rent/use a pressure washer, it’s a good find! 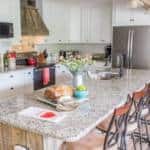 It telescopes down to reduce storage space demand and seems like it will hold up well for cleanings in years to come. 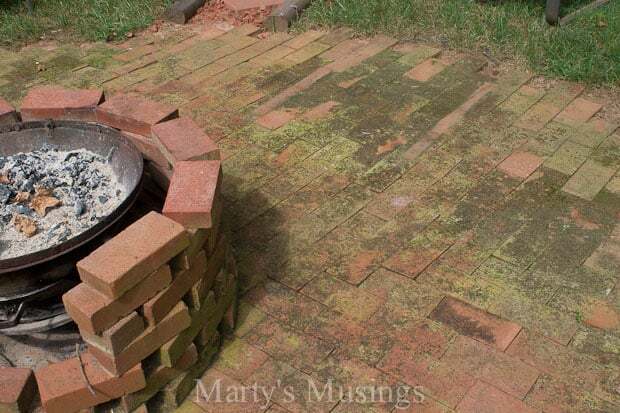 Marty here: You get a little preview of the brick patio Tim created in the back yard. And where did he get the bricks? Glad you asked! A local church in town was tearing down a house on their property and building additional parking. My DIY hubby went and pulled up all the bricks and brought them home in his work van. Sad to say, the van broke an axle pulling into the driveway and had to go to our own personal car graveyard, but the bricks were free! Thanks for the deck washing tip.. 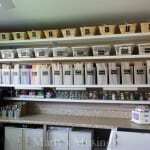 I bought the chemicals and now need to get to work! Good luck, Deborah, with the deck washing! Ours looks so much better and my hubby did a great job, both on the washing and the writing! Have a great day! Thanks for the great tips and advice!! The patio looks so fabulous!! Thanks, Christine! It was fun to see our patio transform and look new again! Thanks for testing out the HomeRight Deck Washer on this project. 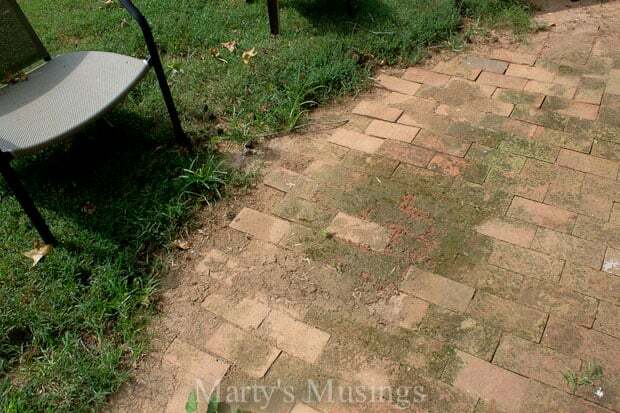 The patio looks great, what a dramatic before and after. Hey, Laura! Thank you for sending us the product to try. It did a great job! I will catch up with you this week for a further conversation on how well the post did and what I might offer you in the future. Have a great weekend! Looks like a big difference and like the brush really works well. 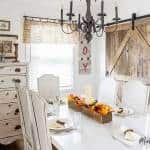 Thanks for great tips to spruce up outdoor space. Patio /deck can make outdoor spaces just as nice as indoor spaces. It’s important to give little attention and care to make them more welcoming and warm as your patio appears to everyone. Thank you, Evie. 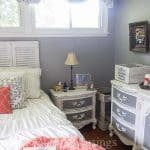 My husband does all the yard work (the kids help, too) and I take care of the inside. 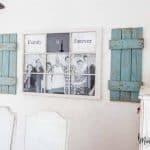 But we’re plotting and planning more projects for the outside and I hope to share some on the blog! Have a great day!